Phishery is a Simple SSL Enabled HTTP server with the primary purpose of phishing credentials via Basic Authentication. Phishery also provides the ability easily to inject the URL into a .docx Word document. The power of phishery is best demonstrated by setting a Word document's template to a phishery URL. 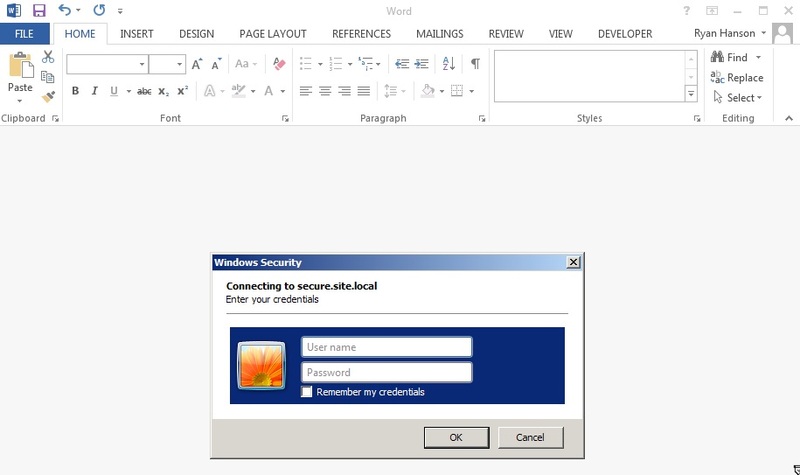 This causes Microsoft Word to make a request to the URL, resulting in an Authentication Dialog being shown to the end-user. The ability to inject any .docx file with a URL is possible using phishery's -i [in docx], -o [out docx], and -u [url] options. Operating system specific packages can be downloaded from here. -h, --help      Show usage and exit. -v              Show version and exit. -u              The phishery URL to use as the Word document template. -i              The Word .docx file to inject with a template URL. -o              The new Word .docx file with the injected template URL. This setup will start the HTTP server on Port 443 with SSL configured to use server.crt and server.key. The basic authentication realm is set to Secure Document Gateway. When any credentials are provided, a 200 response status is sent along with the contents of the included template.dotx and the content type header: Content-Type: application/vnd.openxmlformats-officedocument.wordprocessingml.template. The effectiveness of this tool is based mostly on the Domain and Basic Auth Realm used, as that is often all the end user will see when triggered from an Office document. Make sure to point your DNS A Records the public IP of the phishery server. It's recommended that the provided cert is replaced with a trusted one, such as one generated with LetsEncrypt. Microsoft Word on OS X will prevent the auth dialog if the cert is invalid, and Microsoft Word on Windows will prompt the user to accept the invalid certificate. Once the server is configured and running, all you need to do is embed a phishery URL in a document, or anywhere else your heart desires. phishery does give you the ability to inject your URL into a Word document as a template, instructions on how to do this can be found below. To inject a Word document with a template URL, you'll need a .docx file and the phishery server URL. [*] Injected Word document has been saved! Make sure your phishery server is running and available at the URL you used. Now when the Word document is opened, the victim will be prompted with an authentication dialog.